To view the exhibition catalog please click here. In 2011 President Viji George announced the selection of four exceptional South Indian painters, along with a professor of art history, as the first beneficiaries of the OSilas Gallery’s inaugural International Artist Residency program. The five participants traveled from Chennai, India, to New York in late May 2011, for a 2 – 3 week cultural exchange program, made possible by generous support from friends of the OSilas Gallery. The residency culminated in a reception and show in the OSilas Gallery on Thursday, June 9 at 7pm. A unique collection of the four artists’ paintings and drawings, with themes either rooted in South India or inspired by the residency in New York, were on display and available for purchase, with proceeds benefiting future artist residencies and programs of the OSilas Gallery. Art historian, Dr. Ashrafi Bhagat, spoke about the artists’ work and contemporary art in India. The goal of this innovative program is to foster cultural exchange and understanding, as well as to provide an opportunity for emerging artists from distant lands to gain exposure to the art scene in North America, and share their work with American art aficionados. The Gallery was transformed into a working artists’ studio for the duration of the program, and on open days community members, school groups, and art lovers of all ages came to visit and interact with the artists in residence. The artists also went out into the community, with activities such as a day of plein air painting in the Village of Bronxville, interactions with local artists and students, and receptions hosted by local residents. 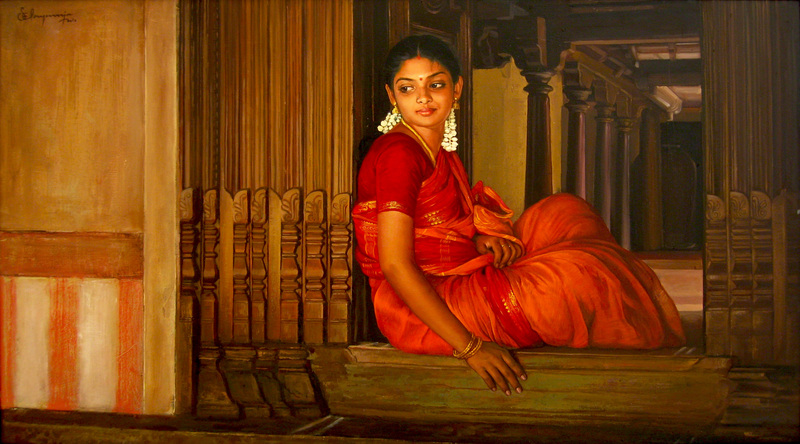 All the four artists hold advanced degrees in fine arts from the Government College of Fine Arts in Chennai, or the Government College of Arts and Crafts in Kumbakonam, both in the southern region of Tamil Nadu. Works by Ranjit and Manoharan are in the collection of India’s National Gallery of Modern Art in New Delhi, and all these artists have exhibited frequently in Indian cities as well as in Singapore, Malaysia and other Asian and Middle Eastern centers. Yet their work is little known in North America, and this residency provides an extraordinary opportunity for Concordia College to showcase new talent, for artists based in the New York area and the visiting artists to exchange ideas and techniques, and for the international visitors to experience the riches of New York City’s outstanding art collections. Speaking recently in Chennai, two of the artists selected, Sivabalan and Elayaraja, said they hoped to draw fresh inspiration and recognition from the opportunity to travel to New York. Elayaraja, for example, whose highly realistic portraits are in the tradition of Rembrandt and Vermeer, longs to see the original works of those great masters. Sivabalan, for his part, cannot wait to see New York’s unparalleled collection of Impressionists and modern masters such as Monet and Gauguin. All events are free and open to public and no reservations are required. Ample, free parking is available on the Concordia College campus. The OSilas Gallery is located in the Donald A. Krenz Academic Center on the second level of Scheele Memorial Library on Concordia College’s Bronxville campus. Visit the artists at work in the OSilas Gallery, transformed for the residency into an artist studio. Visits are free and all ages are welcome! The studio will be open to the public during these hours and by appointment. Visit the artists as they paint the beautiful sites of Bronxville! Artists will paint all day on-site at four locations in town: The Four Corners with the school, village hall, the library and the church; along Pondfield Road- the street scene, with the colored canopies, interesting street lights, old clocks, and people strolling; at the intersection of Kraft and Pondfield with its beautiful flowers, the old Gramatan Hotel tower, the old gatehouse that is now a Houlihan Lawrence office; and on the Hilltop on Wellington Circle, surrounded by historic houses and mature trees. Come and watch them create a masterpiece before your eyes, then see the paintings on view in the gallery. Maps of artist locations will be available in the gallery. Join us for a reception and exhibition of the artists’ work, and a talk on Indian art and the work of the visiting artists with art historian, Dr. Ashrafi Bhagat. Refreshments will be served! Free and open to the public.